1. What are the system requirements for eVSM v10? 2. Which Windows versions are supported by eVSM? 3. Does eVSM run on Apple (e.g. iMac, iPad) devices? 4. Why does my eVSM open in a web browser? 5. What is included in eVSM's annual maintenance plan (ME&S)? 6. Do you have example maps for different application areas? 7. Will eVSM run in Visio 2016? 8. Is eVSM 64-bit compatible? 9. Can I view eVSM maps if I don't have eVSM? 10. The eVSM toolbar (ribbon) is missing when I start eVSM. 11. eVSM says "This file was created in a newer version of eVSM…" and stops me opening the file. 12. I have lost my receipt. How can I get another copy? 13. Why do I keep getting little red circles on my map? 15. My old maps open without the eVSM stencils. How can I open these? 16. I purchased software maintenance. How do I obtain my eVSM update? 17. Are there volume discounts on the software? 18. How do I share my data with people who do not have eVSM? 19. Is there a reference guide to eVSM's toolbar functions? 20. Is there an academic or student’s program for eVSM? 21. Can I get help on older versions of eVSM? 22. What instructor-led training is available for eVSM? 23. How can I buy eVSM? 24. Do you have a distributor for eVSM in my country? 25. What is the return policy for eVSM? 26. I am getting prompted to Insert a Smart Card when I start eVSM. 27. Starting eVSM issues: "C:\Program Files (x86)\eVSM\Setup\Solutions\eVSM.vst is not a valid Win32 application"
28. Why was the Quick Transactional stencil replaced with Quick Transactional Pro? 29. Do I need to re-solve after I change units? 30. What are the preferred computer requirements for eVSM? 31. Does eVSM run in SharePoint? 32. How can I resolve the File Block Visio error message? 33. CaperPing.exe has been quarantined? 34. How to Open Developer Ribbon? 35. Activation was successful, so why do I see a prompt to activate when I start eVSM? 36. How do enable .NET 2.0 and 3.0 Framework on Windows 10? 37. Do any eVSM URLs Need to Be Whitelisted? 38. Is eVSM locked to the user login or to the PC? 39. My Visio File May be Corrupt. Can I Recover my Map? Listed below are common questions related to eVSM system requirements. Licensing related questions are answered here. Any additional questions including those related to usage of specific eVSM Quick Stencils should be sent to support@evsm.com. Excel 2010/2013/2016 (32-bit and 64-bit). The eVSM Software is an add-on to Microsoft Visio. It can run anywhere Visio runs. It can run on a Mac PC provide it has Windows installed (via Bootcamp or Parallels). Currently there is no way to run Visio on iPads or smartphones. eVSM does run on Windows Tablet PC's and is fully supported on Microsoft Surface Pro. You would see this problem if you do not have Visio installed, or if Visio is not the default program for .vst files on your machine. If you do have Visio installed and still see this problem, then please try these steps. Right-click on the "Start eVSM" icon on your Desktop. In the right-click menu, select "Open With>Choose Program..."
In the Open With dialog box that comes up, select Visio, check the box labeled "Always use the selected program...", and click OK. This should associate Visio template files to Visio rather then anything else. ME&S = Maintenance, Enhancements & Support. Maintenance = Updates will be provided at no additional cost to stay in sync with hardware, operating system, and software changes. Enhancements = Access to all new features including major new releases of eVSM. Support = Email and web meeting based support on the application and learning of eVSM. Example maps for different VSM types can be found here. Yes, eVSM v10 is supported on Visio 2016 (Standard and Professional editions, 32 and 64 bit). Older versions of eVSM are not compatible with Visio 2016. Yes, eVSM v10 is 64 bit compatible for Windows, Visio, and Excel. Microsoft Excel and Visio must BOTH be either the 32 bit version or the 64 bit version. Yes, eVSM essentially creates Visio files. These can be viewed in Visio without eVSM. However to edit the file, you need eVSM. You can also save your maps in PDF format which can be viewed even without Visio. This means that the file was created in a newer version of eVSM than the one currently installed on your machine. You will not be able to make any changes to the file unless you upgrade eVSM to at least the version that was the file was created in. However if you only need to view or print the file, have the author of the file send you a PDF version. Contact support@evsm.com and request a copy. The little red circles are indicators of problems with the map that require you attention. Hovering over any of them (or right clicking and selecting ‘Show Warning Text’) will provide you with details of how to take corrective action. Visio files occasionally get corrupt. It's a good idea to backup frequently. 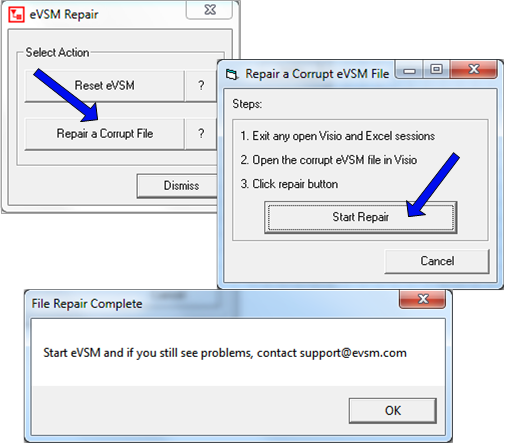 If you suspect a file of being corrupt and you can still open the file in Visio, then you may be able to recover your maps with the eVSM Repair utility. To run the utility, click "Start>Programs>eVSM Software>eVSM Repair" while the Visio file is open. Make sure there are no other Visio files open at the time, because the utility will attempt to repair all open files. In the dialog that comes up, just click the "Repair a Corrupt file" button and follow the prompts. If the above does not fix the issue, please send your map file to support@evsm.com. Select the eVSMIcons.vss stencil file in this folder and then click the Open button. Save your Visio file so it “remembers” this stencil for next time. In the Shapes pane (on left) click "More Shapes > Open Stencil..."
Note that on 64-bit Windows, the file location is: "C:\Program Files(x86)\eVSM\Setup\Solutions"
You can download the latest version of eVSM here. 10% discount for single orders of 10+ New licenses. 20% discount for single orders of 50+ New licenses. Volume discounts are not available for License Upgrades, ME&S, or for Academic licenses. Save the file as a PDF and then send them the file. In Visio 2010/2013, there is a Save As PDF option. In older versions of Visio, you will need to get a separate PDF creator such as Adobe PDF Writer or CutePDF Writer. Go to the Learning page and select your version. Go to Instructor-Led Training Options. Go to the Buy page. eVSM may also be purchased from the following authorized partners. We also work with most resellers (eg. Insight, SoftwareOne, etc.). So if you have a reseller you work with, have them contact us at info@evsm.com. Click here to view the eVSM license return policy. Start Visio, and click "FIle > Options > Tust Center > Trust Center Settings > Trusted Locations > Add New Location... ". Click the Browse button, navigate to and select the folder shown in the dialog below. 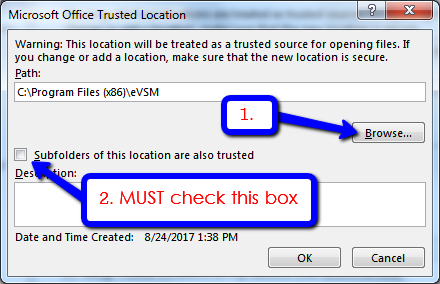 Check the "Subfolders of this locations are also trusted" check-box (VERY IMPORTANT) and then click OK, and Exit Visio. Start eVSM and confirm that the Smart Card message no longer displays. You may see this message if Visio is not the default program for .vst files on your machine. To solve these issues, we introducted a demand simulator into Quick Transactional Pro. You do not need to re-solve for calculated values, which have a blue font. For input value changes, you need to re-solve the map. The two main considerations for eVSM performance tend to be CPU clock speed and RAM available. We recommend using a machine with at least 4GB of RAM available at a minimum. Having 8-16GB should provide better performance with eVSM, as long as you are running the 64 bit editions of Microsoft Visio and Excel. A machine running dual core processors with around 2GHz per core should perform sufficiently. As long as you have a 64 bit system with 64 bit Office/Visio, the more RAM and CPU speed you have, the better the performance will be. Also, having a solid state hard drive will help with loading and saving large Visio files. eVSM needs to create additional files in the folder the Visio file is in. If you have restrictions in your login you will run into problems. Performance will suffer because for some operations you will be slowed down by network bandwidth and traffic (for communication between your CPU and the SharePoint server). Best way to work wirth SharePoint is check the file(s) out for local processing and upload when you are done. 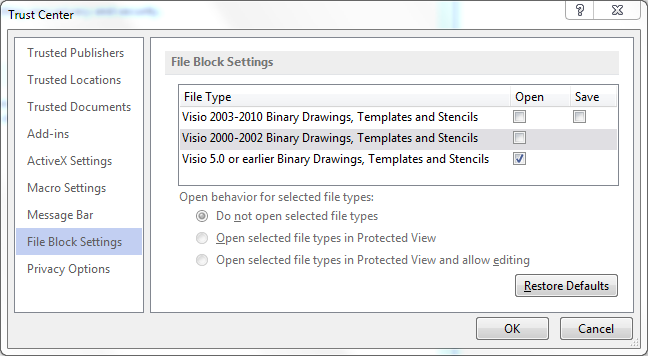 If you see the above message, please check and set your Visio File Block Settings to match the following. The above dialog shows how to get to the File Block settings. 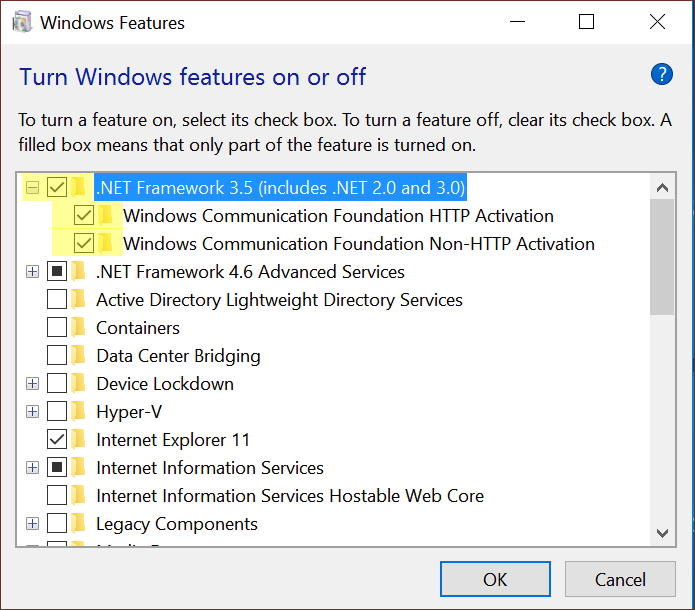 eVSM v10 is fully supported on Windows 10, but needs .NET Framework 3.5 enabled. If not, you will see Error Number:-2146232576 issued at eVSM start-up and will not be able to proceed further. In this event, follow these steps. Close all applications on your PC. Go to Windows Start, and type 'Turn windows features on or off', and pick that from the list. In the Windows Features dialog box, tick all three dialog boxes highlighted below. Click OK, follow any prompts, and re-start your PC. If the user's company firewall or proxy server blocks this communication then these functions cannot work. Following is a list of URLs eVSM needs access to. If see problems with any of the above or other server communications problems, please "whitelist" these URLs. eVSM sends the information in HTTP POST method. The eVSM license is locked to the PC and to user account. 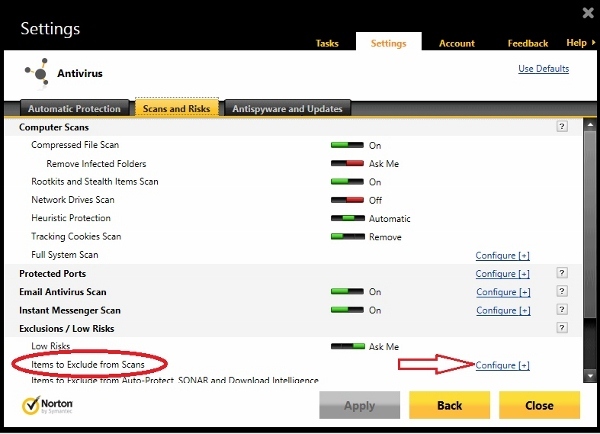 You can install eVSM with an admin account, but the license activation should be done with the end-user login. If you are still able to open your Visio file, you may be able to repair it with the following steps. Leave the Visio file open and in the Windows menus, click "Start>Programs>eVSM Software>eVSM Repair"